Sporty Voyage Backpack is stylish and feature rich. Front workstation includes key fob, business card holder, cell phone pocket, pen/pencil holders and a zippered mesh pocket to protect your valuables. Second large compartment will accommodate an extra set of clothes or a secondary device such as a laptop, portable printer, gaming device, books and files. The dedicated laptop compartment has great protection along with a zippered mesh pocket on the opposite wall conveniently placed for the power adapter and additional accessories. Additional pockets for your multimedia device with a headphone pass thru, retractable water bottle holder along with an additional exterior side pocket for your sunglasses/accessories. 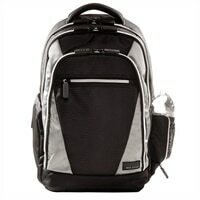 Ergonomic shoulder straps and extreme padding makes this backpack ideal to carry around all day in style and comfort.